How to Choose the right 7 segment display at the end of the article. $0.3-0.6/unit No Poor appearance - clearly visible segments in OFF state. Wide temperature range, long lifetime. 0.2-0.4/unit) No Poor appearance - clearly visible segments in OFF state. Difficult to get quotation for low volumes. Sometimes Good appearance. * 2x2 cm^2 outer dimension of a 1x7 segment display, approximately equivalent to 1 cm2 active display area. The calculations are based on 100 display updates per day. The presented figures are the average energy consumption from multiple datasheets available online. In this seven segment display comparison, we include both emissive displays and reflective displays. An emissive display versus a reflective display gives a significant difference when comparing factors such as energy consumption and optical performance. For instance, a reflective display cannot be used without ambient light, but an emissive display, on the other hand, is close to impossible to read in direct sunlight. Additional factors that will be covered in this article include cost, form factor, electrical driving, connector options. If you’re looking for an ultra-low-powered display technology, a segmented LED display and most likely also a backlit LCD display are ruled out. What you need is a reflective display. This leaves us with three choices; reflective LCD, the E Ink display, and the Rdot display. Reflective LCDs are less complex in terms of energy consumption. Our research indicates that the average power consumption for one square centimeter active display area will consume around 6.6 µW. This figure will not be significantly affected depending on the number of display updates you perform. 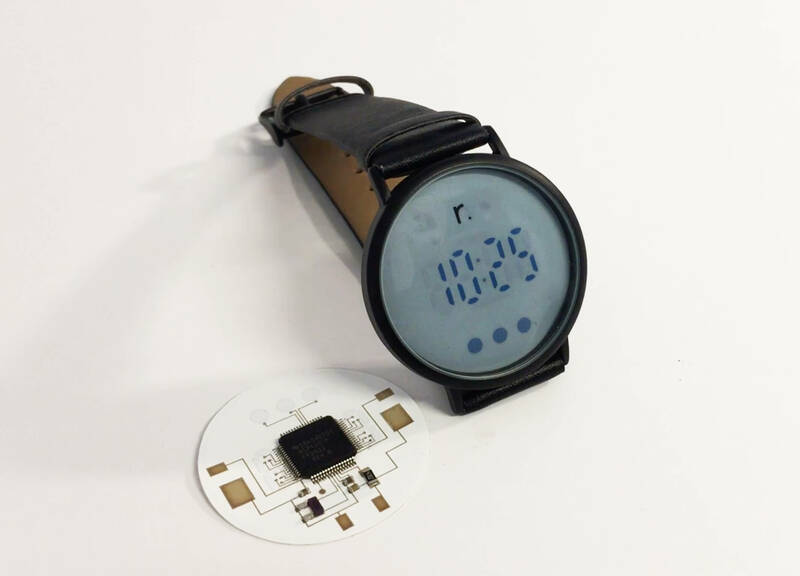 The E Ink display is close to fully bistable, which means that it will not consume any energy for static images. Close to all energy is consumed when the display content is changed. One display update is usually around 4mW during 1 second per 1 square centimeter. With 100 number changes per day, the total power consumption is approximately 4.6 µW/cm2. The Rdot display has similar bistability characteristics as E Ink, but the screen will not retain the image as long as an E Ink display. The image retention time can be anywhere from 0 minutes up to 24 hours, depending on the use-case. For this example, we use a display with 15 minutes of image retention time. At 100 display updates per day, the Rdot display will consume around 1.2µW/cm2. 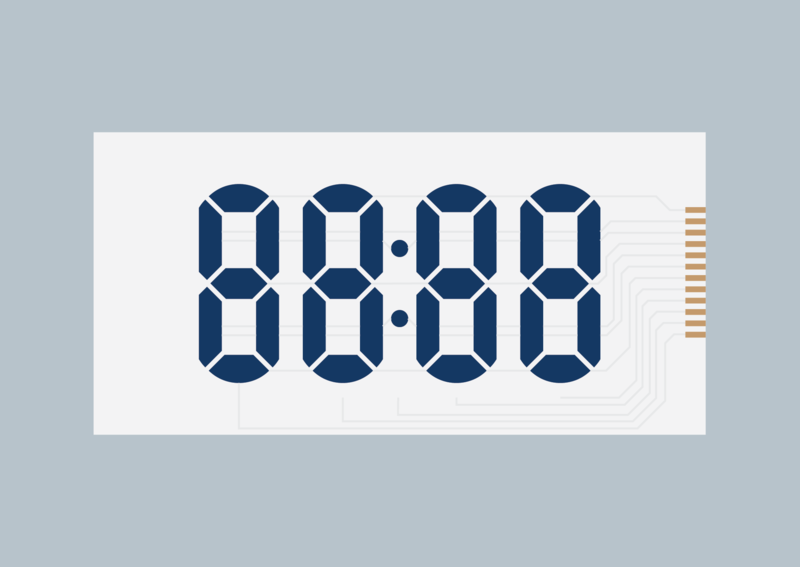 One neat feature to remember is that if the display is no longer powered, the current number on the seven segment display will naturally fade out during the next hour or so - you don’t have to actively turn it off. For more detailed information, please read this article about power consumption. Please contact sales@rdotdisplays.com to request a quotation for your seven segment display project. The Rdot display is the only seven segment display that is bendable. The screen choice will therefore become very easy if your project requires a flexible display. The Rdot display is printed on a transparent plastic substrate that is bendable. The bend radius can be optimized to match your requirements simply through choosing the right thickness of the plastic substrate on which the display stack is printed upon. Our preferred approach to evaluate the optical performance of various seven segment display types is to request samples from the producers. Seeing is believing. The very standard LCD and LED technologies will be easily accessible through multiple vendors. E Ink and Rdot have evaluation kits for sale. For backlit and reflective LCDs as well as segment LED displays, my personal opinion is that the visual appearance is not that appealing. One particular factor is that the segments in the unpowered state are still very visible in relation to the background. Another parameter is the viewing angle dependency. Most low-cost LCDs and LEDs are far away from being perfectly non-angle dependent. Some are even impossible to read if you observe from only a 30° angle or more. Both E Ink and the Rdot displays have close to no viewing angle dependency. E Ink has also managed to create very good black in the dark state, but still only 40% white reflection in the bright state which makes it fairly dark in poor light. The seven segment displays from Rdot will fade into the background color perfectly with accurate driving, which makes the Rdot display together with the E Ink display more visually appealing than the other options. A robust display solution that can reliably work at least throughout the entire product lifetime is apparently a critical factor. From our perspective, the robustness can be broken down into three subparameters; lifetime, operating conditions, and ruggedness. We all know that seven segment displays have been around for a long time. Segment LCDs and LEDs are very mature and optimized. Typical operating conditions range from at least -40 °C to +85 °C, and the display lifetime will exceed almost all expected product lifetimes. Put simply, they are extremely robust. They do have one problem however. They are fabricated on glass, which means that they can crack or shatter. The typical solution to make them more rugged is through making the substrates thicker and also to add other safety measures in the display-device integration. This is the reason why there’s often a significant distance from the surface of the device to the display. The Rdot display is fabricated on a flexible substrate that will not crack or shatter. E Ink also offers some flexible displays with similar properties. Both E Ink and Rdot will not yet compete on robustness in all environments. The operating temperature range spans from 0 °C to 50 °C for the majority of E Ink films, while the Rdot only can guarantee 0 °C to 40 °C to this date. Lifetime is also slightly limited for the two seven segment technologies. The lifetime will depend on the number of display updates that are performed. E Ink suppliers communicate a lifetime number ranging from 1 million up to 10 million display updates. The rdot display has a lifetime that is currently below 1 million updates. Which 7 segment display should I use? The rdot display is the only viable option. It really depends on the number of expected display updates throughout the display lifetime (read a more detailed explanation here). Check out backlit segment LCD display. They consume significantly less power in comparison with other emissive technologies, such as segment LED. The rdot display is most likely the best choice. It is very low cost, ultra low powered, and very environmentally friendly since it utilizes resource-efficient screen printing production and can be constructed with only organic materials. Flexible Displays - Future or Flop?